No, all bedding linen, towels and a tea towel are provided including beach towels for all adult users of the hot tub. Do I need to bring any kitchen utensils? 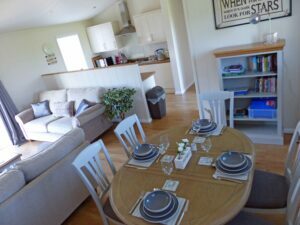 The lodge is well equipped for catering for yourselves and it is unlikely that you will need to bring anything. We provide basics such as cling film, foil, salt, pepper and complimentary tea and coffee too. Please contact us with any questions you may have. Do you provide high chairs and cots? We do not provide these but the lodge has plenty of room to bring your own travel cot etc. In fact Hazel Lodge is very popular for couples with babies. Is heating and electricity included in the price? 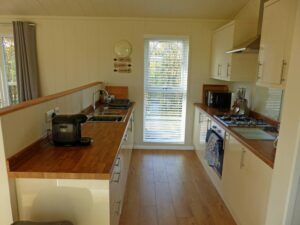 The cost of the lodge includes all heating, gas and electricity. Arrival time is 3pm, departure is 10 am. Entry to Hazel Lodge is by key box and codes will be provided a few days before your arrival. Earlier arrival times and later departure times are by arrangement only. Cancellation – what happens if we need to cancel our holiday? We recommend all our guests take out their own travel insurance. Please see our Term and Conditions before booking. Please contact us on the mobile or landline numbers you will be given for your stay and we will do all we can to resolve any problems/issues. At the Co-op store in Highley which is also a post office. Will the Lodge be cleaned during our stay? The lodge is not cleaned during your stay however an extra clean can be requested at an extra charge. What are the rules regarding celebrations during our stay? At Ash Lodge we try to have a relaxed environment however it is very important that any celebrations do not disrupt the other residents on the site. 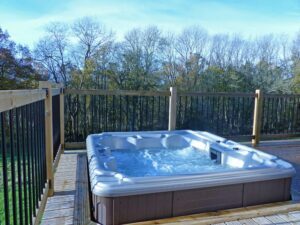 The facilities and hot tub are only for the use of booked guests. Visitors can be allowed by prior arrangement. Please be considerate when playing music especially in the summer months when windows are open. Do you have any rules for using the hot tub? For your well being, health and enjoyment of the hot tub we insist that everyone reads the Hot Tub Policy before use. Do you provide a barbecue? 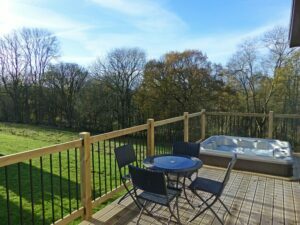 The lodge and decking areas are made totally of wood and present a great fire risk. We therefore do not provide a barbecue and discourage their use. 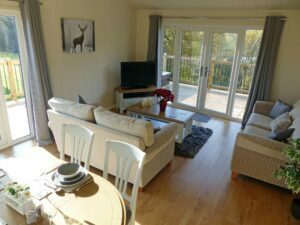 The lodge is all on a single level with just an initial step up onto the front decking from the car parking spaces but if you have specific accessibility need then please give us a call to discuss. Being in a rural area the mobile signal is not brilliant but seems quite adequate on most mobile networks. The lodge does have WIFI and it is quite adequate for general web usage/email etc but being in a rural area the speed is quite limiting for any other type of usage. Can we smoke inside the lodge? Ash Lodge is strictly non smoking. Please pay the balance 2 weeks before arrival, if not paid by this time, guests will receive an email reminder. Will I receive any booking confirmation/directions to the lodge? Upon payment of the balance you will receive a ‘payment in full’ confirmation. A few days before commencement of your stay you will receive an arrival email showing key box code and full contact details. See Where are we? for detailed directions. Where are the nearest food stores? There are two convenience stores in Highley (Co-op and Costcutter) with larger supermarkets being located at Bridgnorth (Sainsburys, Aldi, M & S Food). Highley has a pharmacy plus Indian and Chinese takeaways ( who will also deliver – find menus in welcome pack). On line grocery orders can be delivered directly to the lodge. Sainsburys, Tesco and Asda certainly will deliver. 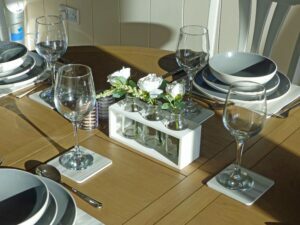 Please quote Plot 3, Hazel Lodge, Billingsley Park Lodges, WV16 6PF when placing your order. There are full details of all services you are likely to need during stay in our welcome folder. Do get in touch if in doubt.